Kudos to Open Table for building a mobile site, but in doing so I�m sorry to say that they�ve made the inaugural post of my series of posts on Mobile SEO best practices (and worst practices). This is a new feature on the blog in which I look at the best and the worst of mobile web design from an SEO perspective. In many cases (as in my coverage of JetBlue mobile�s transcoding issues) I�ll be pointing out worst practices, but I hope this will ultimately help sites increase their visibility, and ultimately help foster the growth of the mobile Web. 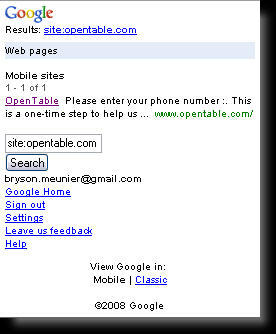 The splash page is an old SEO foe, but OpenTable put a new mobile spin on it with their mobile site, Mobile.OpenTable.com. The personalized mobile user experience is a nice touch, but one must remember that search engine spiders don�t have phone numbers. The simple solution: provide a text link to a non-personalized experience for those users who prefer to use the site while not logged in, or mobile search engine spiders. More content will be crawled and indexed, giving the site more opportunities to be ranked for non-branded keywords. The better solution: kill the splash page. Traditionally the home page of a site, mobile or otherwise, has the highest link popularity of any page on the site, and a splash page like this doesn�t take advantage of that link popularity with competitive keywords. 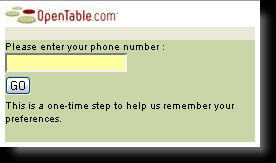 Without the phone input box, OpenTable would be able to add relevant, competitive restaurant-related keywords to their home page, which are clearly lacking from the current design. Sorry, OpenTable. Good luck to the designers who put this together. Hopefully this tip helps them make the site more visible. If they don�t like it, I should point out that there is a money-back guarantee. Know of a site that�s in need of a mobile SEO diagnostic? Shoot the URL to bryson [dot] meunier [at] gmail.com. Single tips like this are free, and full mobile search optimization packages can be obtained through my employer. A great review – posting this is really helpful. That’s pretty much my reaction to this. Have the designers been living in a cave for 10 years? We’ve been screaming about splash pages since 1997. Forget about the spiders, can you imagine the visitor drop off on this site? How many people will give them their phone number? What insanity!